You can now select the transition and edit the expression that describes the equation in the '''[[STEM Expression Language|#Expression Editor|Expression Editor]]''. 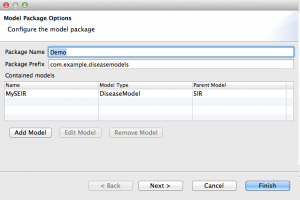 The model package is the container for all disease models in a given Model Generator project. 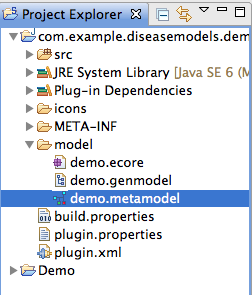 The Package Name and Package Prefix are combined to create the resulting Eclipse plug-in/project identifier. 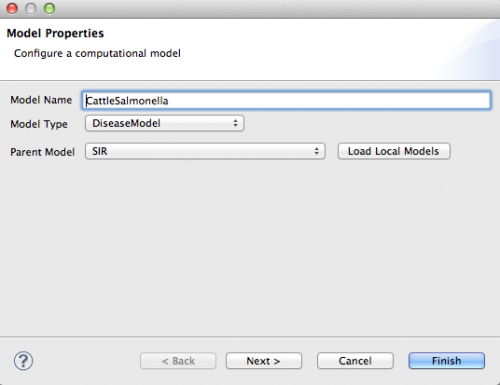 For example, the model package with name and prefix above will generate an Eclipse plug-in/project with ID com.example.diseasemodels.cattlesalmonellosis. 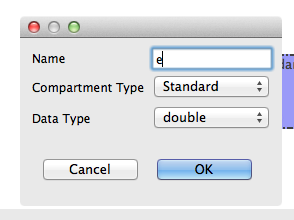 This plug-in, once automatically generated, will be added to your STEM runtime (while it is running). Later we will explain how you can also send this plug-in to colleagues you wish to share it with. 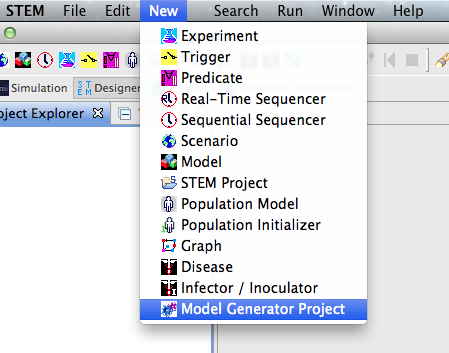 Before the Model Generator can generate the project, you must add at least one computational (disease) model. 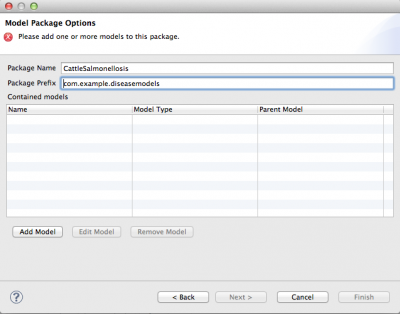 To begin, click Add Model. This will launch the New Model Wizard. 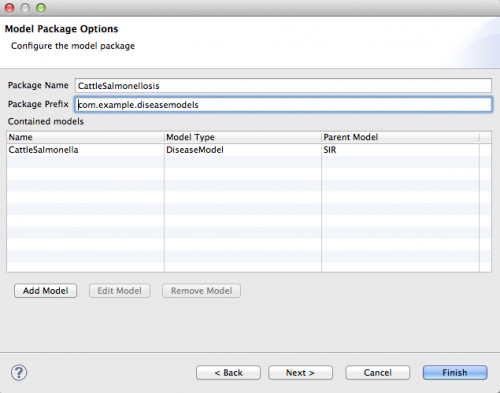 To configure the model, enter values for the model's name, the model's type, and which parent model it extends and inherits parameters and compartments from. All fields are required. These are the minimum settings required for a computational model. At this point, you can click Finish to add the model. 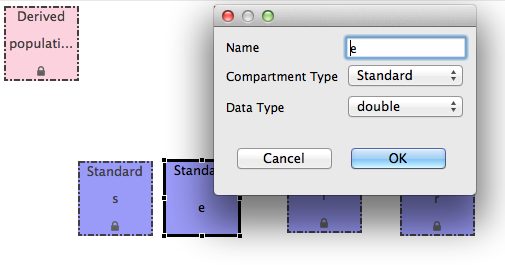 To add model parameters and compartments, you can either click Next and use this form or later edit them from the Visual Editor. 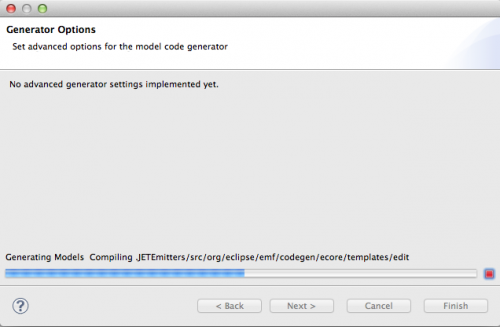 When you've added a model to this project, you're ready to run the code generator. After the initial Model Generation completes, your new model will open in the Visual Model Editor. You're now ready to begin defining the compartments and transitions that describe your compartment model. See the next section for more information. 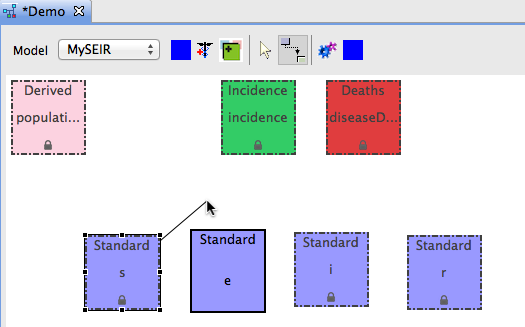 The STEM Visual Model Editor is a new tool that allows scientists to describe the structure - and mathematics - behind their computational model in an easy to use graphical user interface. Transitions between compartments represent the movement of population from one state to another during a STEM simulation. Each transition is described by an expression - or equation - that describes the flow out of the source compartment and into the target compartment. For more information about the expressions, see the Expression Editor section. You can now select the transition and edit the expression that describes the equation in the '#Expression Editor|Expression Editor. 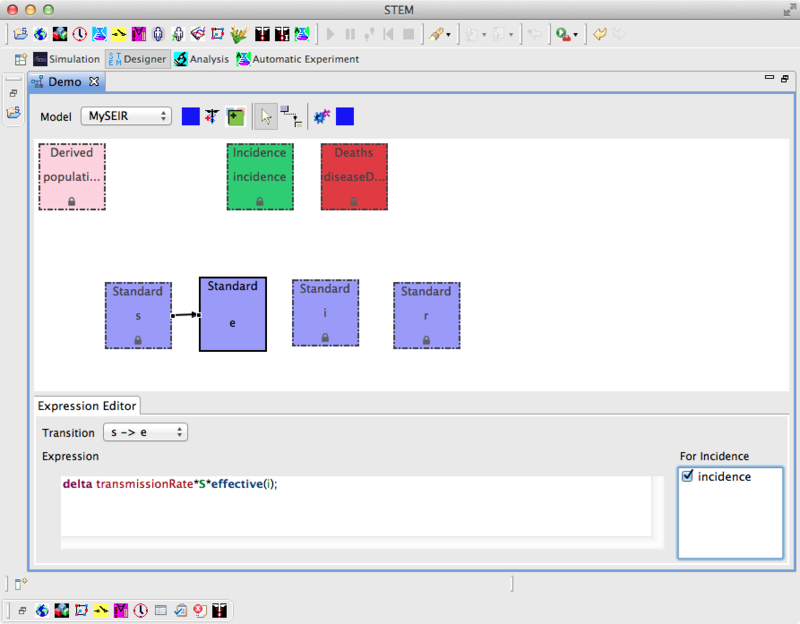 The Expression Editor allows you to input the mathematical expressions that define the transitions between model compartments using the STEM Expression Language. 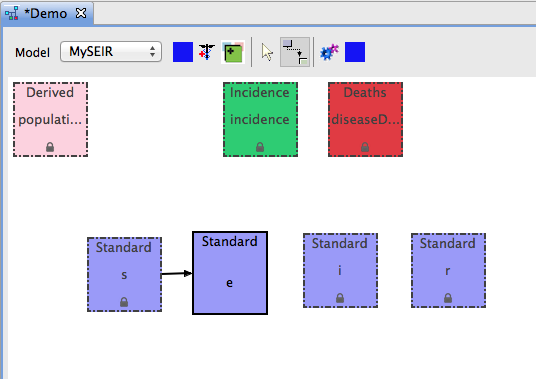 For more information about the expression editor, see the Expression Editor article.